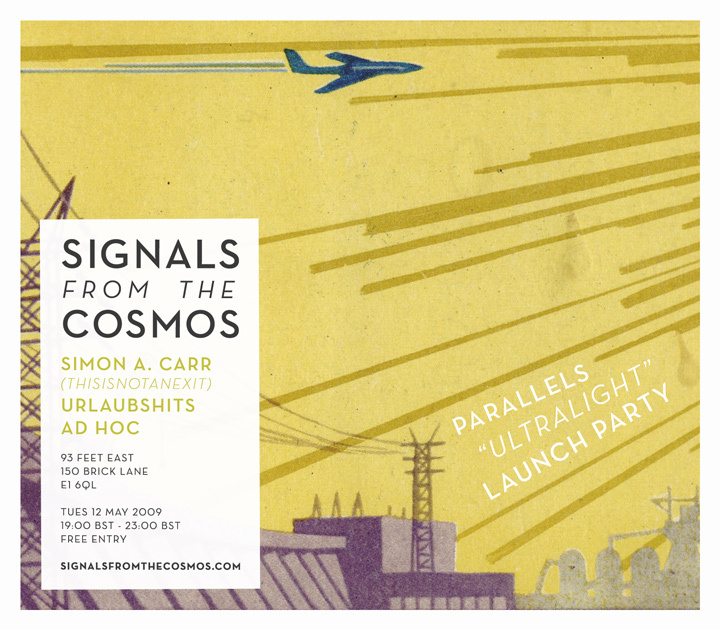 In T-minus one week, it's the second edition of our new monthly night of cosmic sounds at 93 Feat East, Signals From The Cosmos. This month we have joined forces with London record label Thisisnotanexit (responsible for records from artists such as Hatchback, Detachments, Brain Machine and Spectral Empire) to celebrate their latest release, the new Ultralight EP from soon to be massive Canadian duo Parallels. Unfortunately we can't afford to get Parallels to London to play for us, but we do have TINAE label boss Simon A. Carr performing a rare DJ set. Expect future music of the highest order. In addition we will be giving away a copy of this awesome record to one lucky winner. Best of all, entry is free. Also find us on Facebook or last.fm.